Memoir is a tricky genre. On the one hand the subject of the memoir is greedily consumed by its readers; on the other hand questions surrounding the veracity of memory come into the forefront. Memoirs of Sylvia Plath have been particularly scrutinized: even the ones written in the first decade or so after her death when memories are presumably fresher. Ted and I by Gerald Hughes (Robson Press, 2012), brother of the poet, is a book worth reading. In some ways Gerald is "the other" or is "an other" in the life of Ted Hughes: a dream, an ideal, that would never be realized. Ted and I is divided into three sensible parts; "Childhood"; "The War Years"; and "Keeping in Touch". Each part is further divided into subparts. "Childhood" was the least emotive part of the book: a series of broken memories, shorter staccato vignettes and mostly nondescript that in some ways could describe the childhood of any myriad of boys and girls. Not a criticism by any means, just a failure to engage the reader in a period of time long ago...Ted Hughes himself spoke about these years quite convincingly as being crucial to his development. Particularly so in his "Two of a Kind" interview with Sylvia Plath and Owen Leeming in January 1961. Ted Hughes says, "when I was about eight then all that was sealed off, we moved to Mexborough which was industrial and depressing and dirty and - oh well at the time made us all very unhappy but it was really a very good thing. It became - it became a much richer experience for me than - than my previous seven years had been, but in being as different it really sealed off my first seven years so that now I have memories of my first seven years which - my first seven years seem almost half my life. I've - I've remembered almost everything because it was sealed off in that particular way and became a sort of brain - another subsidiary brain for me." Readers of Sylvia Plath will note with particular interested how the image of childhood sealed off would be reused more succinctly in her own way in her late January 1963 prose piece which examined the landscape of her childhood: "Ocean 1212-W". "The War Years" was incredibly moving and well written. The stories and experiences of Gerald Hughes during this time make the book memorable, as well as the last part "Keeping in Touch". Readers of this blog will find "Keeping in Touch" of the most interest for this is where Sylvia Plath is inserted into the story. The never published before photographs complement quotations from previously unpublished letters from Plath's to Gerald and his wife Joan, whom she never met. The original letters from Sylvia Plath and Ted Hughes to Gerald and Joan are part of Hughes mss II at the Lilly Library. These letters of course were readable in the Reading Room, but before now not really ever quotable. They provide some biographical information, are mostly chipper, show some wit, and in my opinion make Plath quite a likable figure when compared to the impression one gets when reading her letters to her mother in Letter Home. Gerald even says of the tone of the correspondence: "We felt close" (144). As the memoir progresses we see Plath pass. Gerald describes Plath's death as "dreadful" (163). But in citing some of his brother's letters, we get a differing opinion from the one so often discussed in biography. What is generally reported is that Hughes and Plath were close to repairing their relationship; that they were two weeks away from reconciling things. But in Ted and I, we see Ted Hughes writing to his brother, "All this business has been terrible - especially for Sylvia - but it was inevitable" (163) Gerald describes the breakup, in Ted's words, as a "relief" (163). This is not dredged up to pick a fight with the Hughes family or Hughes readers and fans, but it does show that the dissolution of the marriage was messy and in some ways we will obviously never know what Ted Hughes' intentions were, nor where the relationship actually stood. Maybe we are not meant to. 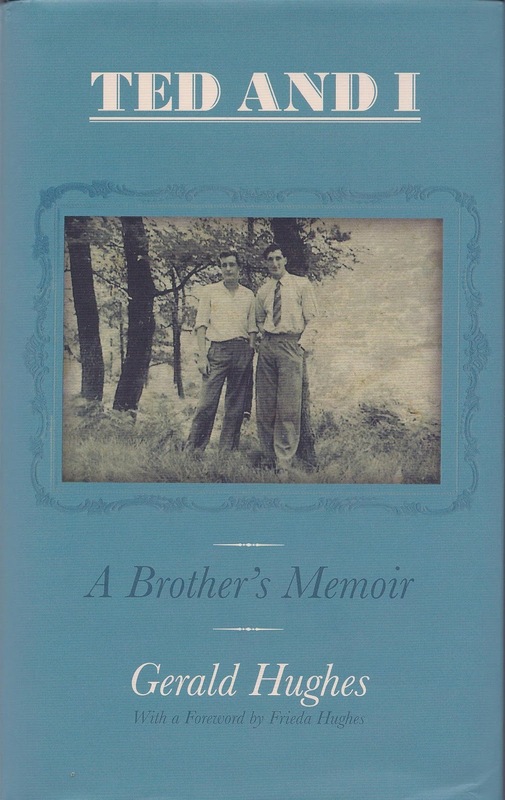 Gerald Hughes writes sincerely about his brother post-Plath. The paragraphs on Plath's nervousness surrounding the publication of The Bell Jar are difficult to read, but also highlight an under-exposed circumstance in the last weeks of Plath's life: how publication of the novel affected her under all the circumstances she was living in during January 1963. Not to digress too much, but how different might Plath's situation have been had The Bell Jar been published in 1962, as was originally planned by Heinemann? Copies of the proof of the novel have a copyright date of 1962. The novel's publication was of course delayed because Plath one the Saxton grant, and Heinemann were quite gracious in delaying it so she could claim all the reward money. Remember that as the novel was already completed, Plath just bundled it up into four installments and submitted it quarterly per the requirements... Had the novel been published in 1962, it might have been before the breakup of her marriage and she might have been in a different frame of mind to see her story out there. All these "might have"'s are largely speculative, of course, and also rhetorical in nature. Back to Ted and I and the chapter "Keeping in Touch", Assia Wevill and her daughter Shura pass, too, and eventually Ted Hughes. These episodes are treated naturally, with tact and genuine feeling, so that with each death the reader cannot help but feel affected for the personal way in which she or he engages with Gerald Hughes' writing. The reproduction of Gerald Hughes' artwork are quite impressive, and show a creative talent running through the family. Ted and I, with a foreword by Frieda Hughes is a good book. Overall the sibling and family love is clear and candid. Thank you Gerald Hughes, and Frieda Hughes, for getting these memories in print. Buy the book from The Robson Press. I have had my book for a couple weeks now, and still have not found time to open it, with the Plath Symposium, the storm, administering midterms and now resuming real life. I hope to read it this week. Peter, did you find, having read the original letters already at Lilly, that they have been heavily excerpted in the book? That was one of the things that most impacted me in reading full letters in the Lilly myself as I recollected the partial ones I'd read in Letters Home, Ted Hughes' Letters, etc. I have been reading articles by our fellow blog reader Carole Brooks Platt, and she has a lot to say about the actual brain process that seems to create great poets with that "sealing off" of trauma in childhood. Interesting stuff! Perhaps she will weigh in. It is my personal opinion that Hughes was deluding himself, and perhaps his brother too, about a possible reconciliation with Plath. Assia was still entirely present, as well as other women such as Susan Alliston. Hughes had a guilty conscience, and this fantasy was one way to assuage it, and to comfort his children. IMHO. I look forward to reading it soon. If I can find an hour or two! Fascinating review, Peter. I also think Hughes was deluding himself about a reconciliation. Thank you Julia and Carl for your comments. I haven't looked at the letters to compare them between the original and the printed. I know that Plath's communications were largely added to a letter Hughes was also writing, though sometimes she sent her own letters if there wasn't space on Hughes' letter, or in one instance where Hughes sealed the letter before SP got her paws on it... In that regard the letters are edited for they do not quote from Hughes' part. I can go through it tonight. If you're talking about SP's Letters Home versus what is in the archive, then, yes, massively edited. Ted and I is a very quick and engaging read: and I read slowly so for me reading it in chunks over two days or so is quite rapid. Thank you for your wonderful review, Peter! Can't wait to get my hands on this book! Anna: the pictures are lovely and, I should think, considered by many to be in fact spectacular. There is a great photo of them (though somewhat blurry) of Plath and Hughes on the Queen Elizabeth in June 1957. Some photos of Plath from this trip have been published before, but not, I don't think, this one. And, there is a fantastic photo of Plath, Hughes, Edith Hughes and baby Frieda from 1960 in Yorkshire. Probably August when they visited for a bit (and went to Whitby). There are great photographs of Ted Hughes too, spanning his life. Some letters are dated, some not: May 1957; December 1957; 3 March 1958; August 1958; 24 May 1959; 7 April 1960; September 1960; 19 August 1961; December 1961; May 1962; and 10 June 1962. Christmas card December 1957: largely reproduced in full, missing closing salutations (pg 146-7). May 24, 1959: largely excerpted, most of the letter not reproduced (page 148-9). September 1960: letter largely excerpted (page 153). Christmas 1961: letter about half reproduced (page 160). Great review Peter - I bought this book last week and it has been sat on my shelf until I finish my current reading. I'm rather excited about starting it now. Fascinating that we can get new bits of information even now - so many years after the fact! This is the first review that actually tickles me to click the buy button which will have to wait a while for the £s to pile up again following another very recent and expensive book-spending spree. Books spell my life, reading is quite literally all I do or have done. There have been a series of Hughes memorial books in recent years. All very amusing to read.